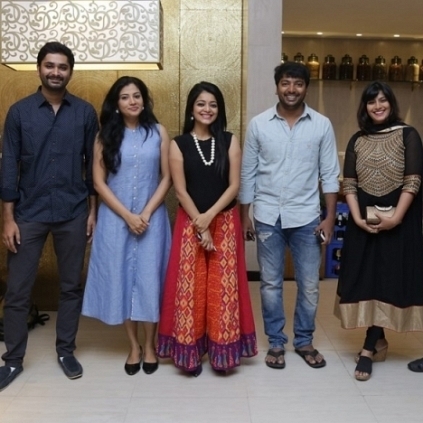 Adhe Kangal is the recently released thriller film starring Kalaiyarasan, Janani Iyer and Sshivada in the lead roles directed by Rohin Venkatesan. The movie has been getting good, positive reviews and the character portrayed by Kalaiyarasan is that of a blind chef. Eyesight plays an important factor in the core story of this suspense thriller. Recently, the producer, C.V. Kumar had arranged for a special screening of Adhe Kangal at Le Magic lantern preview theatre for the visually challenged students. A kind and friendly gesture from the makers of the film indeed! Breaking: Nenjam Marappathillai release date is here! Kalaiyarasan's Raja Manthiri Completes Its Post Production Work. Madras Fame Kalaiyarasan Is Doing A List Of Films ! People looking for online information on CV Kumar, Janani Iyer, Kalaiyarasan, Rohin venketsan will find this news story useful.